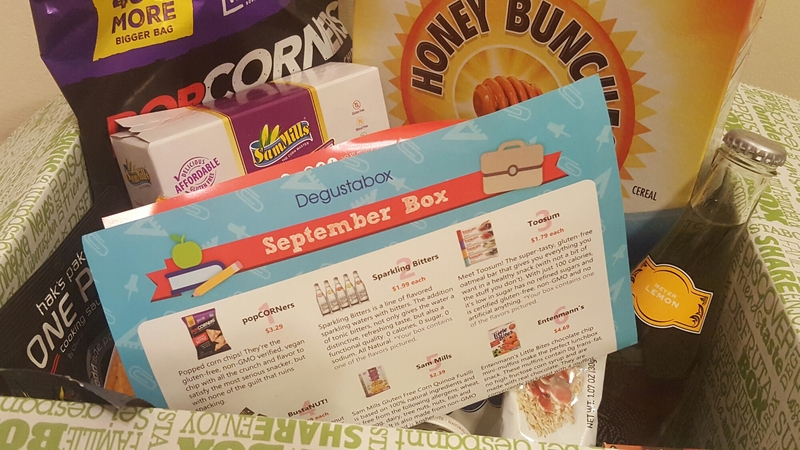 Earlier this month, I received my September Degustabox! Packed to the brim with snacks, drinks, spreads and more, it’s always a welcome surprise. 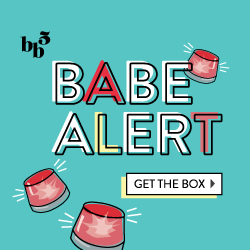 Each box will feature at least 10 full-sized products + samples from a variety brands including new release items and old favorites. Subscriptions are $19.99/month with free shipping within the US. This full size bag of PopCORNers Carnival Kettle Popped Corn Chips ($3.29) are non-GMO, vegan and gluten-free. Woo! More than that, they’re delicious! Kettle corn is one of my favorite types of popcorn because of the mix of salty and sweet, covering all of my cravings. While I’m not gluten-free or gluten-sensitive, I always like trying new things, so I was intrigued by this Sam Mills Corn & Quinoa Pasta ($2.39). While it tasted good, the texture and flavor was a tad different than a classic or whole wheat pasta, but still tasty, and felt healthier since it was made with quinoa. Last month they included Honey Bunches of Oats with Strawberries, so I was happy to see this box of extra box of Honey Bunches of Oats Honey Roasted Cereal (N/A- Est. $4). This wasn’t on the info sheet, but I don’t mind it! This beautiful trio of small batch The English Provender Co. Condiments ($7.35) are a great addition to any cheese board. The trio includes Caramelized Red Onion Chutney, Luxury Lemon Curd, and Sweet Tomato & Chili Chutney. I definitely see myself gravitating toward that lemon curd! Nando’s Peri-Peri Sauce ($3.49) is AH-MAY-ZING. I first tried Nando’s when I studied abroad in Australia, and I was totally addicted to the chicken sandwiches. I tried to go there as often as possible, and always put peri-peri sauce on everything. Highly recommend trying it! Hak’s Paks One Pot Rustic Ratatouille ($3.99) is a ready-to-go one pot meal starter made with garlic, onion, herbs de Provence, tomatoes, zucchini, carrots, and other yummy stuff. All you have to do is add a pound of meat and let it cook! This Sparkling Bitters Meyer Lemon Drink ($1.99) sounds like the perfect drink mixer to me! It’s an all-natural sparkling water with a dash of tonic bitters, that can be consumed as is or used to make a crafty cocktail. I was cracking up (shelled peanut pun) over the name of these BustaNUT! Flavored Peanuts ($3)! Seriously, I started googling to find out more about them. I was excited to see them in these unique bourbon and maple bacon flavors. I can’t wait to try them! These little boxes of Michel et Augustin Shortbread Cookies in 2 varieties ($1.99) are just pure cuteness. Each of these little boxes contains 6 bite-sized shortbread cookies., one a traditional shortbread, and the other box a shortbread with chocolate chips. Entenmann’s Little Bites Chocolate Chip Muffins (~$1) used to be a staple in my house growning up, along with the brownie bites. While this isn’t a new or innovative product, I didn’t mind receiving it. I’d love to see a new Entemann’s product, maybe something seasonal. Toosum Gluten-Free Oatmeal Bar ($1.79) is a 100-calorie, gmo-free, gluten-free and vegan oatmeal bar! It reminds me of oatmeal on-the-go, especially in its cranberry acai flavor. Overall, I was happy and somewhat surpised with my September Degustabox. There were some products I knew and used before (Entemann’s, Nando’s, PopCorners) and then some exciting new and innovative items. 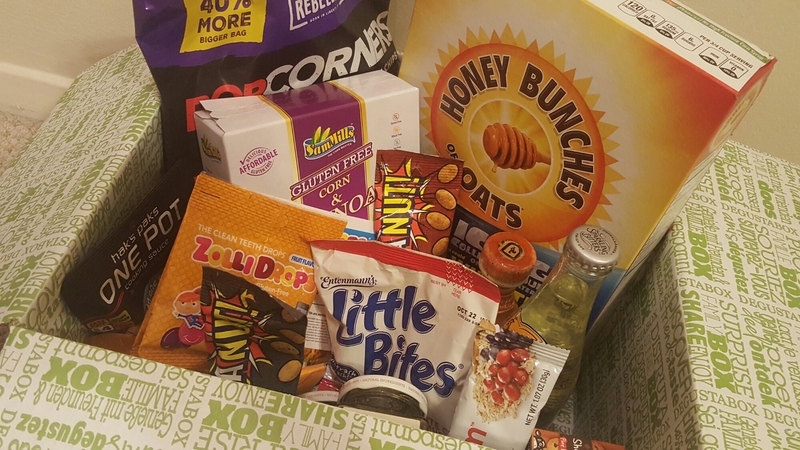 What was your favorite item in this month’s Degustabox? Check out my previous reviews here, or click here to subscribe today!